Russian Mufti Council (based in Moscow). Its leader Mufti Ravil Gainutdin. This council leads 1,686 communities. Religious Administration Center of Muslim Russia (based in Ufa). Led by Mufti Talgat Tadzhuddin and united 522 communities. The Muslim Coordinating Center in the North Caucasus is led by Ismail Berdiyev, Mufti Karachai-Cherkassia and the Stavropol region, and consists of 830 communities. As mentioned above, there are many mosques in big cities in Russia. Officially the number of mosques in Russia reaches 6790 mosques, but the actual number is much larger and continues to grow. In Dagestan alone there are between 2000 – 3000 mosques. In the last ten years the number of mosques in Tatarstan has exceeded 2500. In the Russian capital of over 6 million Muslims there are 20 Muslim communities and 5 mosques. According to Russian data experts, there are at least 9,000 mosques in Russia. In addition to community organizations oriented to Islam. There are also Muslim student communities in Russia. This community came from outside Russia who got education in Russia. In fact, not infrequently in the famous universities in Russia there are mosques and community of Islamic students in Russia. In Russia there are also Islamic-oriented universities like the Islamic university of russia. (Russian language: Российский исламский институ). For the Russian community itself, majority of Muslims in Russia follow the teachings of Sunni Islam. In some areas, especially in Dagestan and Chechnya, there is a tradition of Sufism, represented by the Naqsyabandi and Shazili tarekat led by Shaykh Said Afandi al-Chirkawi ad-Daghestani. The Sufi practice gives the Caucasus a strong passion for rejecting strangers, and has become a legend among the Russians against the Caucasus in the Tsarist era. Azeri people are Shiites, when they are not the people of the Soviet Union, many Azeris are migrating to Russia to find work. About 40 km from Ufa, capital of Bashkiria, there are two ancient tombs of the 12th and 14th centuries that are still well preserved namely the tomb of Akzirat and the tomb of the Turukhan tomb. The process of building Akzirat’s tomb is done by Timurlang, the famous conqueror of Central Asia and the founder of the famous Eastern Dynasty. Next to Hussein-Bek’s grave, there are several graves with Arabic inscriptions believed to be the cemetery of the warlords of the East. This Islamic sights are located on Mount Aushtau, South Ural Mountains. This spring is believed to have healing properties. There is trust, those who bathe in the Auliya springs and accommodate their holy water can cure various diseases such as kidney stones, respiratory and stomach diseases. No wonder, millions of pilgrims come here every year. This city is the oldest city with a Muslim community. The city has two sacred places sacred mainly by Muslims in the North Caucasus ie Tutibike and Kyrkhlyar cemetery. Here there is also a Russian Muslim cemetery under the name Tubitike. Tubitike cemetery was built between 1787-1788 by the rulers of Derbent and Cuba, Fet-Ali-Khan in honor of Tutibike, his wife and companion in ruling Derbent. Eat there is a place of historic sites 600 years ago. This tomb is the tomb of the local governor who became the representative of the Turkish ruler Uzbek.makam Borga Kash is still well maintained. Arabic writings are still visible above the entrance. 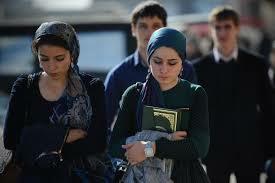 Many Russians regard Islam as a religion of peace, a religion of respect for all, a tolerant religion. In addition, they also argue that regard Islam and other religions as an integral part of their culture. This is because traditional Islam is an integral part of Russian spiritual life. However, despite this, Russian Muslim clerics oppose the development of ‘radical Islam’ which is potentially dangerous and provokes Muslims to commit acts of terrorism. The Muslim scholars also claimed that traditional Islam is not only guided by the Qur’an, but also in the Muslim tradition that lives in harmony side by side among religious believers.